For 2018, the Nissan Armada adds various new equipment, such as NissanConnectSM Services, an 8-inch multi-touch display, HD Radio, SiriusXM Travel Link, Enhanced Voice Recognition, Hands-Free Text Messaging Assistant, and additional USB ports. A new Platinum Reserve package features two-tone leather seats, as well as Dark Chrome accents and rims, while Intelligent Rear View Mirror (I-RVM) is now standard on all Platinum models. 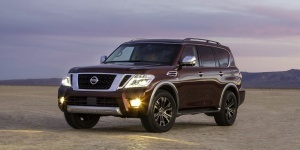 Get the best price for the Nissan Armada of your choice from a dealer in your area. Request a price quote now.